"A Clone of My Own" is the twenty-third episode of Futurama, the tenth of the second production season and the fifteenth of the second broadcast season. It aired on 9 April, 2000, on Fox. Having lived for 150 years, Farnsworth is worried about his legacy and his work, and decides to create Cubert, his clone. Having failed again, he admits his actual age and is taken to the Near-Death Star. 1.2 Act II: "Is he dumb or just ugly?" 1.3 Act III: "Why do I have to be the hump?" The Professor announces good news: the university is bringing him up on disciplinary charges, though this is not good news at all. When he and the Planet Express crew arrive at Mars University, he discovers it's a surprise 150th birthday party. At the party, they play a video made by Leela showing the Professor's life, examples of inventions like fast cars, trendy night spots and beautiful women he created in his tiny apartment. The video, along with all the comments of his friends make the Professor think he's wasted his life. Leela tries to console him by saying he still has 10 years left. Only 10 years, because when old people turn 160, Sunset Squad Robots take them to the Near Death Star and they never return. He decides to name a successor. After a few days in his lab, the Professor returns to announce his successor's identity. Neither Fry, Leela, Bender, Hermes, Zoidberg nor Amy (who is trusted the Professor's dentures) turn out to be the successor despite having thought one of them was going to be. The Professor reveals his 12-year-old clone, Cubert. Act II: "Is he dumb or just ugly?" Cubert is released from the Clone-O-Mat. He comes from one of the growths on Farnsworth's back. He is similar to a young Professor Farnsworth, excluding his nose, which is flattened because Farnsworth left Cubert in his first tube too long and it got squished. Cubert is instantly critical of the staff, asking them why they need a bending unit and why the captain has only one eye. When the Professor begins showing off his inventions like the Smell-O-Scope, the Universal Translator and the Dark Matter Engines of the Planet Express ship, he criticises them too, saying "It's all impossible". The Professor takes everyone to Elzar's for dinner to celebrate Cubert being named successor, but Cubert doesn't want to be an inventor. The Professor is very sad because his hopes were broken by Cubert so he records a message for his staff, revealing he's been lying about his age. He's actually 160 and he has alerted the sunset squad to take him away. One of the robots of the sunset squad comes for Farnsworth and takes him. Act III: "Why do I have to be the hump?" The crew and Cubert receive the message and use the Smell-O-Scope to track him down. Leela finds the Professor's odour and they mount the Smell-O-Scope to the ship. As Leela pilots the ship Fry smells to look for the Professor and they arrive at the Near Death Star. Bender and Leela disguise themselves as sunset squad robots while Fry disguises himself as the Professor. They need a sample of Farsnworth's DNA, and when Cubert says it's impossible, they get some Farnsworth's DNA from Cubert with a big syringe. They walk into the Barrier Bots, Cubert is inside Fry's coat as the hump. Though still suspicious because no one can escape from the Near Death Star, the Barrier Bots take the Professor's DNA sample and confirm it's him. They give the sunset squad robots, who are actually Leela and Bender, the Professor's address. The crew fly to the interior of the Near Death star, and discover lots of old people being held by machines that get their clothes off and take them to their buildings. Fry, Bender, Leela and Cubert are in the middle of thousands of tombstones-shaped buildings, all of them with a lot of little drawers with the names of old people written on them. They open Farnsworth's drawer, and see him lying in it with tubes connected to him. They have to disconnect him carefully or the shock could kill him. However they are discovered so they run off pulling Farnsworth out. The Sunset Squad Chasers chase them in some hover-ships while shooting. Fry, Bender, Leela, Cubert and Farnsworth (still unconscious) manage to escape and enter the Planet Express ship. A Sunset Squad Chaser shoots the engines and they have to fix it quick. But the only who knows how it works is the Professor. Cubert finally wakes up after being hit by a closing door and says "nothing is impossible". He realizes the Dark Matter engines don't move the ship: the ship stays where it is and the engines move the universe around it. So he fixes the engines and they escape. Back at Planet Express, Farnsworth is alright and tells the crew that the Near Death Star made him think he was in Florida with the rest of the old people. Cubert decides he does want to be an inventor like his father. The speed of light was increased; it is impossible to go faster than this new speed of light. However, old light waves are still at the old speed. This is one of several episodes written by Patric M. Verrone where the title rhymes with his last name. The Near Death Star looks very similar to the Infosphere. In the French dubbing of this episode, German is the "incomprehensible dead language." 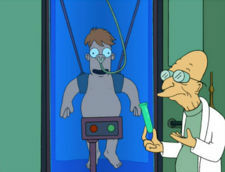 During "A Big Piece of Garbage", Dr. Ogden Wernstrom swore he would take revenge on Professor Farnsworth, even if it took "another 100 years", but this episode shows people who are over 160 years old reside in the Near Death Star, so he would only be able to do it in case he and the Professor were to be both there. As is the case with exaggeration, we must take it lightly. The film gives Professor Farnsworth's birthday as 9 April, which is the episode's air date. Second reference to French being a dead language. Previously evident in the pilot. The Professor's time machine echoes the design from the 1960 film of H. G. Wells' book The Time Machine. Hell's Laboratory, cited as the place of Professor Farnsworth's youth, is a joke on the neighborhood known as "Hell's Kitchen" in New York City, with 'laboratory' substituted to make it nerdier. During the countdown to Leela's film about the Professor, one of the symbols looks remarkably like the 'point of origin' glyph (i.e., 'Earth') from the movie and television show Stargate. Doctor Zoidberg references Showtime at the Apollo while talking about Professor Farnsworth. The concept of mandatory retirement based on age is taken from Logan's Run, where 'Sandmen' similar to the Sunset Squad chase people older than 30 years of age. The Sunset Squad Chasers look similiar to Darth Vader. The Near Death Star parodies the Death Star. The Hologram is based on Princess Leia's hologram in Star Wars Episode IV: A New Hope, including looking to the side and turning off the recorder. The high-speed chase draws from each film of the Star Wars saga: The start is based on the chase on the Moon of Endor in Star Wars Episode VI: Return of the Jedi. The central part echoes the dramatic sorties on the surface of the Death Star in the original Star Wars. The end parallels the escape from Cloud City in Star Wars Episode V: The Empire Strikes Back. Some of the sequences in these scenes also may be a subtle visual reference to the 1983 Star Wars arcade game developed by Atari and designed by Mike Hally (particularly when they quickly move up and down to avoid crashing while speeding through the interior of the Near Death Star). Captain Musky is based on Star Trek's Captain Pike ("musky" is short for muskellunge, a member of the pike genus of fish). The distinctive wheelchair returns in a later episode. A piece of music evocative of Darth Vader plays as Captain Musky approaches the podium (which is interesting, as both Vader and Pike use black life-support machines). The hookups of the elderly and their being kept in a fantasy world are reminiscent of the plight of humanity in The Matrix. The parallel being expounded upon in "Near-Death Wish". Also, the freeze-frame pan-around used just as the Planet Express Ship lifts off parodies the signature style of the Matrix. The horror movie franchise A Nightmare on Elm Street and the Twilight Zone episode "Monsters are Due on Maple Street" are referenced on a street sign from the Near Death Star. Right after Farnsworth mentions Hitler, the portal of Mars University which reads "Knowledge brings fear" is seen. A reference to concentration camp entrances which read "Arbeit macht frei" ("Work brings freedom"). Saving Hitler's brain might be a reference to the movie They Saved Hitler's Brain. In 2851, you can see a Slurm ad. Slurm is described as a medical tonic in a possible reference to the fact that Coca-Cola was initially sold as a nerve tonic. Schrödinger's Kit-Kat Club is a reference to Erwin Schrödinger's Schrödinger's cat thought experiment in quantum physics, as well as the Kit-Cat Club, an 18th century London literary and political group. The spelling also parodies Kit Kat bars. The scene where Zoidberg is roasting the professor is reminiscent of a scene from the Friends episode "The One with Barry and Mindy's Wedding". The character Ross is making a toast where he is believed to be joking during his first statement (whereas the drummer makes a rim-shot), and is actually joking during the second (with no rim-shot). Farnsworth: Everyone's always in favour of saving Hitler's brain but when you put it in the body of a great white shark, ooh, suddenly you've gone too far. Zoidberg: Good evening, ladies and germs. [Rim Shot.] That wasn't a joke. I was talking to Dean Streptococcus. Fry: Sorry, everyone, but need I remind you? Blood is thicker than water. Zoidberg: [writing] Blood ... thicker ... water. Farnsworth: I have a very dramatic announcement. So anyone with a weak heart should leave now. Goodbye. Leela: Wait. If he's your clone, why doesn't his nose look like yours? Farnsworth: I left him in his first tube too long and he got squished up against the side. Barrierbot: Did your hump just say something? Fry: Uh ... I-I've got talking hump syndrome. Bender: Your social security check is late! Stuff costs more than it used to! Young people use curse words! Sunset Squad Chaser: [Crashing into the wall.] Ah, I'm so bad at this. Cubert: Dr. Zoidberg, do you even have your medical degree? Zoidberg: I lost it. In a volcano. According to the birth dates of the Near Death Star residents, one of them (Eloise Porter) is only about 145 years old. However they aren't supposed to take anyone under 160. It's possible that at the time she was taken, the standards may have been different as to what age people were supposed to be taken, and Farnsworth may have been lying even back then to protect himself from the Sunset Squad. Cubert is supposed to be the clone of Professor Farnsworth, but he seems to lack the same myopia as the Professor, even though he is 12 years old and the Professor has been shown to have worn glasses since he was 8. However, it is possible that the Professor artificially improved Cubert's eyesight during his development stage. Another possibility is that the Professor's poor eyesight may have been from an accident during his youth, rather than being a genetic trait. This page was last edited on 19 July 2015, at 00:19.